﻿ Chicago Hispanic Newspaper, Lawndale News, Hispanic Bilingual Newspapers, Su Noticiero Bilingue » Evo Morales for Dictator! April 19, 2019 5:46 pm You are here:Home Commentary Evo Morales for Dictator! Posted by Editor on February 1, 2018 in Commentary | Comments Off on Evo Morales for Dictator! 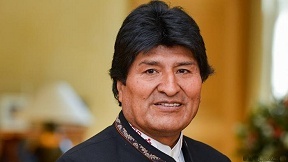 A referendum back in 2016 that would have allowed current Bolivian President Evo Morales to run for a fourth term as president was completely defeated. The very Bolivian Constitution that he helped draft in 2009 had a provision on presidential term limits. Now that is being cast aside as Evo Morales wants to run on a fourth term and wants to run as many times as long as he can stay in power. It goes without saying that power corrupts and absolute power corrupts absolutely. This is what is happening in Bolivia now. The Evo Morales administration has become embroiled in corruption scandals—one example is with a Bolivian business lady named Gabriela Zapata who mis-appropriated public funding. She is rumored to have been Evo Morales girlfriend who used that connection to gain such money in the first place. No one needs to look any further than the museum President Morales had built in his native town of Orinoca called the Museum of the Democratic and Cultural Revolution. The place has actually been called the Evo Morales museum because it is really all about him. If there is any place that can be termed as an institution of a cult of personality it is there. There can be no question that Evo Morales intends to follow in the footsteps of current dictator in Venezuela Nicolas Maduro of staying in power indefinitely with or without the consent and approval of the Bolivian people. But there will be a price to pay. That price is that neither Morales nor those who stay with him in power will be able to be impeached or voted out. This will mean that only the executive branch has any power and those in it cannot be thrown out of power. In this it is very clear we have dictatorship. I had feared that from the very beginning Evo Morales, like Venezuela’s former ruler Hugo Chavez and Nicaragua’s current dictator Daniel Ortega, first became heads of state. In the end this will not only make for a more unstable Bolivia but also a more unstable South America.